The Indian government offers a number of policy support mechanisms for renewable power at the federal level. Sandhya Srinivasan compares and contrasts existing renewable energy policies against a proposed set of debt-related policies and provides a framework for choosing the most appropriate policies based on policy priorities. As India tries to improve energy security and mitigate climate change, the role of renewable energy has become increasingly prominent. The Government of India has set an ambitious target of 15% grid power from renewable energy by 2020 (NAPCC, 2008). •Viability gap funding – a capital grant – of up to 30% of project cost for solar projects under the National Solar Mission. The federal policies typically cover only a part of the viability gap, which is the difference between the cost of unsubsidised renewable power and the wholesale price of electricity of Rs 3.5/kWh. The rest is supported by state governments entering long-term Power Purchase Agreements (PPA) with renewable power developers, agreeing to pay feed-in tariffs for a period of 20-25 years. Given the ambitious goals, but limited budgets, the cost-effectiveness of these federal policies becomes an important criterion for policy choice. It also raises the question of how policies would affect the delivered cost of renewable power. In our previous work (Nelson et al, 2012), we examined the impact of policy on the delivered cost of renewable power in India, and found that the unfavorable terms of debt significantly limit the impact of finer policy pathways. The median interest rate for a sample of recent renewable projects was 12.3%, about twice than the 5-7% range typical in the US (ibid). Further, commercial loan tenors are 10-11 years – much lower than the 20-25 year project life cycles. Together, these factors – high interest rates and short tenors – when combined with a variable rate of interest, raise the cost of renewable power by 24-32%, compared to similar projects in the US (ibid). Unfavorable debt terms are not unique to the renewable power sector, but are significant for renewable power as they limit the impact of other renewable policies. These make it difficult for firms to assume a higher level leverage in their debt-equity mix. Since debt-leverage cannot be optimised in response to policy changes, the impact of policy support on the cost of renewable power is not as instrumental as observed in other contexts, such as in the US. In particular, among the criteria examined, policymakers would face a tradeoff between cost-effectiveness and the potential to incentivise production. Policymakers are also likely to prioritise different criteria in the short-term and the long-term. For example, one-year budget efficiency is an indicator of short-term policy performance, while subsidy-recovery is only relevant in the long-term. •Reduced cost debt, where the federal government would directly lend below the commercial loan cost. We compared these policies against existing federal policies using representative project-level cash flow models to investigate the impact of each policy. 1.What is the cheapest way to subsidise renewable power? The total cost of a policy to the government determines its cost-effectiveness. We measured this using the net present value of the total subsidy, which is the sum of state government subsidies, federal government subsidies and tax subsidies. 2.To what extent can the federal government support renewable power in the absence of state-level support? Viability gap was measured as the difference between the cost of renewable power and the wholesale price of power. Given ambitious renewable energy goals, garnering support from state governments can be challenging. Viability gap coverage potential evaluates the extent to which a federal policy can bridge the viability gap in the absence of state-level support through feed-in tariffs. High viability gap coverage would make it easier to gather state support for expensive renewable goals. 3.How much of the budgetary allocation could the federal government recover over time? The subsidy-recovery potential is the percentage of the federal subsidy cost that could be recovered by the federal government over time, e.g. through loan repayments in the case of concessional loans. This enables the federal government to assess whether the funds deployed under a particular federal policy could be reused for other productive purposes. We measured this by comparing the net present value of cash outflows under each federal policy against the cash inflows over time. 4.How do we ensure that a policy mechanism incentivises production and not just capacity installation? Depending on the structure of the policy mechanism, it may incentivise the installation of additional capacity or the generation of energy. One of the criteria that federal policymakers consider is the potential to incentivise generation. This would enable them to identify a policy that best supports the federal government’s objective of reaching 15% of electricity generation through renewable energy by 2020. 5.Given a fixed annual federal budgetary allocation, how much capacity could be funded under each policy? The last criterion, one-year budget efficiency, indicates the number of megawatts of renewable power capacity that could be supported by the federal government in one year using a fixed annual budgetary allocation. This enables the government to identify federal policies that would have the highest deployment potential in the short-term. One-year budget efficiency is measured as the total capital outlay for the federal government for the first year. In our analysis, we compared policies in three different ways. First, to explore attractive short-term alternatives, we compared debt-related policies to existing policies at current support levels. Second, to ensure comparisons against the same baselines, we evaluated all federal policies given a fixed state-level support. Third, to explore attractive long-term alternatives, we compared all federal policies at their cost-effectiveness potentials. In this article, we present results from the first and third approaches. Our analysis shows that there is no single policy that outperforms the others on all parameters (Figure 1). In general, debt-related policies are more cost-effective than existing policies. However, policymakers are often required to make decisions by balancing multiple objectives rather than a single metric. With the exception of one-year budget efficiency, which is a short-term measure, a combination of reduced cost debt and extended-tenor debt performs well across policy criteria. It is a very attractive policy for both wind and solar power in the long-term if cost-effectiveness and subsidy-recovery are the most important objectives for decision-making. For example, compared to the baseline with no federal policy support, a reduction of 3% in the cost of debt and an increase in tenor of 10 years reduces the total subsidy burden by 29-61% for solar and wind, respectively. The improvement is even more striking when the most cost-effective versions of policies are compared. For wind power, compared to the most cost-effective version of the existing generation based incentive (at Rs 2.03/kWh), a 5.9% loan with a 10-year increase in tenor could reduce total – i.e. the sum of federal, state, and tax – subsidies by 78%. For solar power, with the same increase in tenor, a loan at 1.2% would reduce total subsidies by 28% compared to the existing viability gap funding (at 56%). 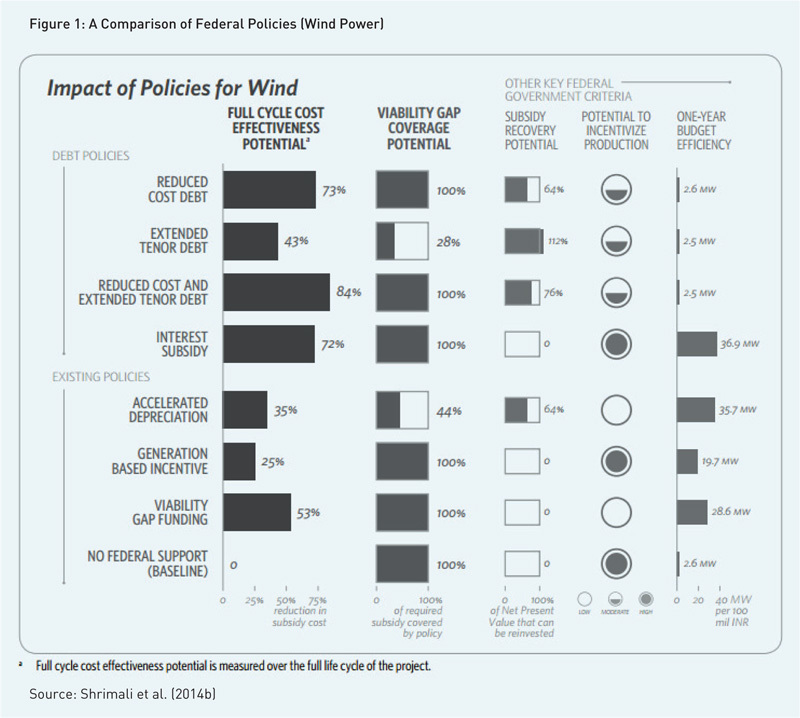 Furthermore, this policy combination – i.e., reduced-cost extended-tenor debt – would allow for a high degree of subsidy-recovery — i.e., 76% for wind and 49% for solar. This combination also has a viability gap coverage potential of 100% and shows moderate potential to incentivise production through the pressure of debt-servicing. By providing low-cost, long-term loans, the federal government’s resources can be deployed effectively while reducing the need for state support. Since the government can mobilise funds at a lower cost compared to private developers due to its much higher credit rating, it is possible to pass on the benefit of this borrowing capacity to renewable project developers at a relatively low cost compared to the existing policy mechanisms. Though this combination appears to do less well in terms of one-year budget efficiency (Figure 1), in the long-term, its performance would improve considerably due to subsidy-recovery. In the short-term, if the one-year budget efficiency is an issue, there are a number of alternative policy options for the federal government. In particular, interest subsidy and accelerated depreciation are more attractive than the existing generation based incentive at its current support level of Rs 0.5/kWh for wind power and the viability gap funding at its current support level of 30% of total project cost for solar power. For wind, an interest subsidy outperforms the existing generation based incentive at Rs 0.5/kWh across all criteria. Holding state support via feed-in tariffs fixed, an interest subsidy of 3.4% is equivalent to the existing generation based incentive of Rs 0.5/kWh; and, compared to this generation based incentive, would result in not only a total subsidy reduction of 11% but also support 83% more deployment. Similarly, for solar, holding feed-in tariffs fixed, an interest subsidy of 10.2% is equivalent to a viability gap funding of 30%; and, compared to this viability gap funding, would result in a total subsidy reduction of 11% and support 30% more deployment in one year. An interest subsidy is an attractive policy since it directly addresses the lack of availability of low cost, long-term debt with a relatively low capital outlay by the federal government. It has a high potential for incentivising production and a moderate potential for viability gap coverage. The only potential drawback of an interest subsidy is that subsidy-recovery is not possible. However, since the capital outlay is not very large, especially compared to existing policies at current support levels, this may eventually not be a major issue in the short-term. For wind, we find that for the same state-level support, an accelerated depreciation of 38% – i.e., less than the typical 80% – is equivalent to a generation based incentive of Rs 0.5/kWh; and, compared to the existing generation based incentive, would result in a total subsidy reduction of 17% and support 87% more deployment in one year. Similarly, for solar, for the same state-level support, an accelerated depreciation of 80% is equivalent to a viability gap funding of 12.4%; and, compared to the viability gap funding, would result in a total subsidy reduction of 10% and support 44% more deployment in one year. In the short-term, accelerated depreciation is the most cost-effective among the existing policies. However, it has been criticised because it encourages capacity installations, without incentivising power production. It also has relatively low viability gap coverage potential, which means that the federal government would require state support via feed-in tariffs even if it allows accelerated depreciation up to its theoretical maximum. However, from the federal government’s perspective, accelerated depreciation is one of the easiest policies to manage since it requires no cash disbursement. There is no direct capital invested by the federal government and the initial reduction in tax revenue is partly recovered in later years. Therefore, its advantages as a policy may eventually outweigh its drawbacks. We recommend modifying the design of accelerated depreciation or combining it with debt-related policies that could improve the incentive to produce through the pressure of debt-servicing. For example, for solar power, with the same state-level support of INR 4.9/kWh, the combination of 80% accelerated depreciation with reduced cost debt at 2% reduces total subsidies by 27% compared to the existing policy combination of 80% accelerated depreciation and 30% viability gap funding. Furthermore, the combination of accelerated depreciation with reduced cost debt would have a moderate potential for incentivising production, enabling the policymaker to improve cost-effectiveness without compromising on incentivising production. In this article, we compare existing federal policies – the generation based incentive, accelerated depreciation and viability gap funding – against proposed debt-related policies that would either reduce the cost of debt or extend the tenor, using project-level cash models and a framework that uses multiple criteria identified by policymakers. Although there is no single policy that performs better than the others across all criteria, our analysis presents policymakers with crucial tradeoffs that would enable them to choose appropriate federal policies based on relevant policy goals. We find that there exist combinations of policies that could satisfy multiple policy priorities. Debt-related policies show potential to improve policy outcomes in both, the long and the short term. In the long-term, a combination of reduced cost, extended-tenor debt is clearly the most desirable policy. In the short-term, if the policymakers’ priority is to identify a policy mechanism that ensures budget efficiency, interest subsidy performs the best. However, if the federal government prefers providing a subsidy upfront rather than entering a long-term commitment to subsidising a project, accelerated depreciation is more cost-effective and has high one-year budget efficiency. Sandhya Srinivasan is an assistant analyst with the CPI-ISB Energy and Environment Programme, Hyderabad office, a joint programme set up by the Climate Policy Initiative (CPI) with the Indian School of Business (ISB).